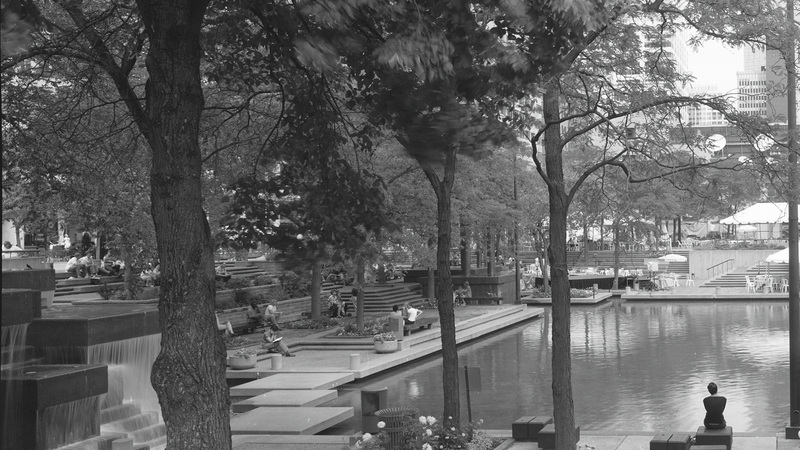 Peavey Plaza, a Modernist urban plaza in downtown Minneapolis, Minnesota designed by landscape architect M. Paul Friedberg that opened in 1975, has just been listed in the National Register of Historic Places. The designation was made official on January 14, 2013. Peavey is the progenitor of the "park plaza" style of design that combines the hardscape of European plazas and American green space. The plaza, which is currently threatened with demolition by the City of Minneapolis, is widely considered the finest surviving example of Friedberg’s work from the period. Friedberg, a recipient of the American Society of Landscape Architects (ASLA) Design Medal in 2004, the organization’s highest award, is one of the nation’s leading landscape architects. Peavey joins an elite group of works on the National Register – of the more than 88,000 sites on the Register, less than 2,500 have significance in landscape architecture. Historical consultant Charlene Roise, president of Minneapolis-based Hess, Roise and Company, prepared Peavey Plaza’s National Register nomination. Peavey Plaza is featured on the cover of Forum Journal’s Winter 2013 issue, which focuses on Modern Landscape Architecture: Presentation and Preservation.